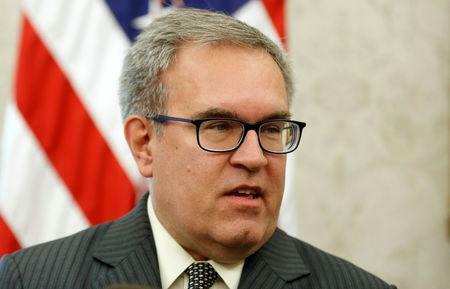 WASHINGTON (Reuters) - Five Republican senators are warning President Donald Trump's new pick to run the Environmental Protection Agency, Andrew Wheeler, that their support for his nomination may hinge on his biofuels policy. The Renewable Fuel Standard requires oil refiners to blend increasing amounts of biofuels like corn-based ethanol into their fuel each year, or purchase blending credits from those who do. The measure is intended to help farmers and reduce U.S. dependence on foreign energy sources, but oil refining companies - like Valero Energy Corp and billionaire investor Carl Icahn's CVR Energy Inc - complain it costs them a fortune. "Without an adequate proposal to meaningfully lower the regulatory burden ... we will have serious concerns with your nomination," the five Republican senators said in a letter to Wheeler dated Feb. 11.